This year, the plan was for me, Tim, Zippy, Nigel, Amanda, Jon, Jaynie to be there, with Steve and Mich sharing childcare and marshalling duties between them, making up one full time equivalent. In the build up, Zippy persuaded her daughter, Paige to join us and after Alan dropped out of the L50 following an injury sustained in the 12 Labours of Hercules ultra marathon a few weeks previously, he decided that the next best thing to running the race was marshalling it. That brought us up to 10, and given that Steve and Mich's kids, Alex, Josie and Ethan, were so happy playing around the site, chatting to us and the runners, they didn't need much looking after, so Steve and Mich both put in a full day's work, meaning we had 11 people working close to full time. Last year, the van with the kit arrived much later, with Tim and Zippy having seen the start of the L100. This year, Tim and Jon picked it all up and by the time I arrived at 7.30ish (I hate the m6), the van was unloaded, the tent was up, the tables were up and Zippy was busy making sandwiches. Her idea of mass food production was a little faster than everyone else's! For the past 2 years, there has been a huge rush mid afternoon, as the 50 runners all come in over a 3-4 hour period. At this point, you lose track of time, react to their needs and constantly keep going. It's a mad rush, and one I was keen to avoid if at all possible. As previously, we had to heat soup and make sandwiches for the runners. And it was the butties that has always caused us the problems. This year, we brought huge storage boxes, and made as much up as possible the night before, and during the morning. This was a huge help, as when the crush finally arrived, a lot of the prep was done. We'd received notes from the organiser, Marc Laithwaite, which said to expect the first runner at 7am. This was impressive stuff, given that he'd have covered 75 miles in 13 hours through the night by this point. We weren't sure what he would want, so we had to make sure that everything was ready. We also had to be aware that we had to look after ourselves during the day. Everyone focuses on the runners, and they have a really tough day, but last year, we put in a 21 hour day, so we had to pace ourselves too. So, an early start, porridge and sausage sandwiches courtesy of The Zippy Catering Company, and we were ready by about 6.30, without having to rush or feel flustered. 6.30, no runners. 7.00, no runners. 7.30, still no one. We played our usual game of spot the runner/ is it a runner or a rock, as we looked over the lake to the tree line, where we knew the trail led it's way along the river towards the checkpoint. Marko arrived at about 8.30, with Charlie Sharpe 45 minutes later. 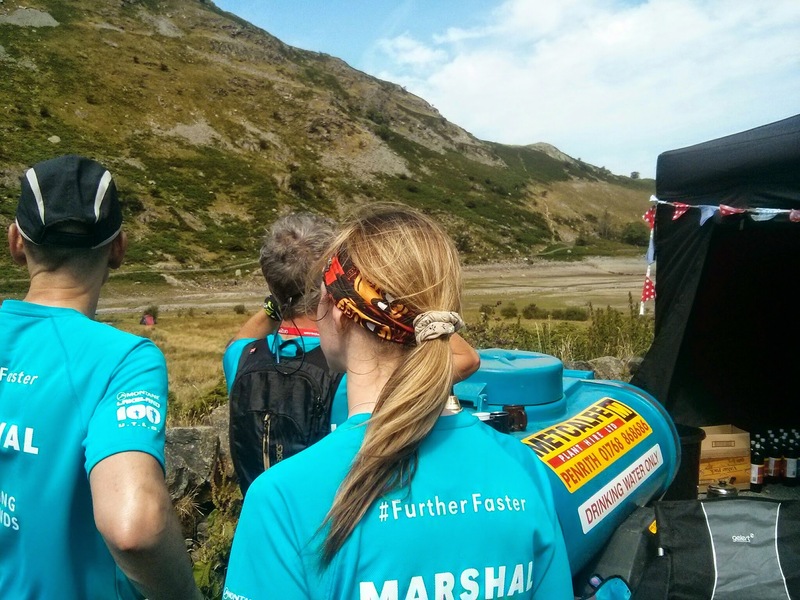 Marko extended his lead over the next 30 miles, and Charlie finished in second place. The next few runners came in over the course of the morning, with long gaps between them. The first of the 50 runners came in, 'dibbed in' (used the electronic tracker system to check in with us, and update the tracking system at HQ), and ran straight off again! To be fair, we were a little bored. Poor Paige wasn't sure what she had let herself in for, she was in a car park in the middle of nowhere, being attacked by midges, surrounded by people who thought that running a 50 mile race was normal! (Nobody thinks running a 100 mile race is normal, do they?) So where were all the runners? The heat that day was enough to melt the Tarmac in the car park. We'd had a couple of weeks of heat wave, and the weather overnight was into the mid teens, meaning that all of the runners had slowed down dramatically. 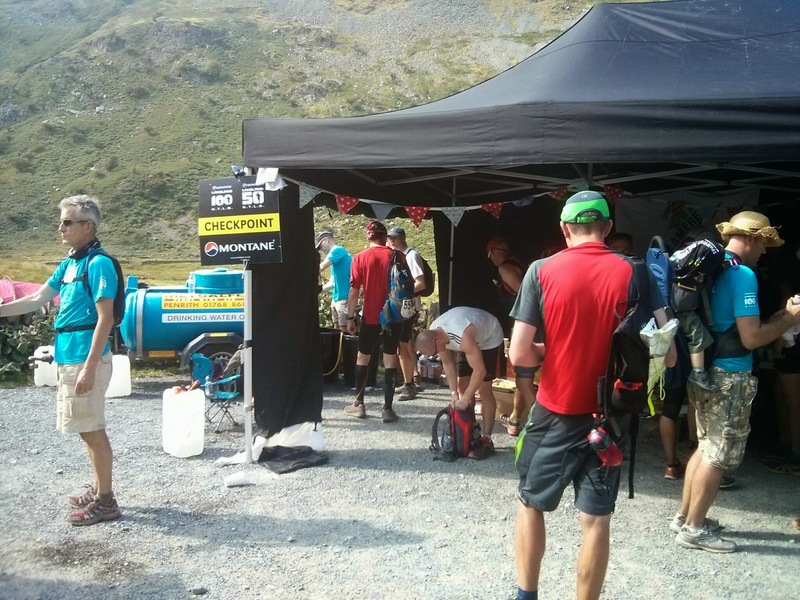 As more and more people came in to the checkpoint, we heard increasing tales of drinking from streams, filling water bottles from the lake and so on. Some people, fearing for their health, hadn't filled their water bottles after they ran out, and had come the 10 miles from the previous checkpoint at Howtown with their 2 Salomon (or similar) soft water bottles, each carrying only 150ml of water, and not refilled them, meaning they were getting to the very thirsty point by the time they arrived. I was constantly amazed by how ill people looked on arriving, and by how fresh they appeared for some water, a cup of tea and a sandwich when they left 20 minutes later. The newly purchased Spartan gazebos proved to be well worth the money. Some people were stony faced, not wanting to talk; they had the food and drink pointed out to them, and were told if they headed to the black tent, they'd be looked after. Most were somewhere in between. As we clapped and yelled at them, most people, who had been walking, broke into a run towards us at the gate, so we clapped harder. This was great, it felt as though we were inspiring people. As time went on, and the slower runners came in, it was clear that we were not always helping by doing this, some runners tried their hardest to break into a run towards the checkpoint, but at best could be described as shuffling. These people were possibly the most inspiring. It's wonderful what soup, sandwiches, and a bit of a rest can do. People left the checkpoint full of determination. Some were in high spirits, some were grim, some looked awful. People thanked us for our help, applauded our efforts, but really, it was the runners who needed the applause. It never fails to amaze me what people are capable of. This isn't really a lesson we have learned, or at least, we learned it the first year we marshalled, and each year reinforces it, but we come from the wilds of Cheshire up to Mardale each year in part to give something back to the wider running community, but mostly to support our friends from the club who are running in the races. More Spartans than ever were running in the 50 and 100. We spent the morning wondering who would come in first, how people would do, and then Gareth dropped in, looking tired, but certainly not like he'd run 75 miles. A bit of soup and a sandwich, and he was one of the many to head out with a cheery wave a short while later. Andy as the first of the 50 runners to arrive, with a 45 minute lead on Nick, who announced his chunderous presence all over the car park. 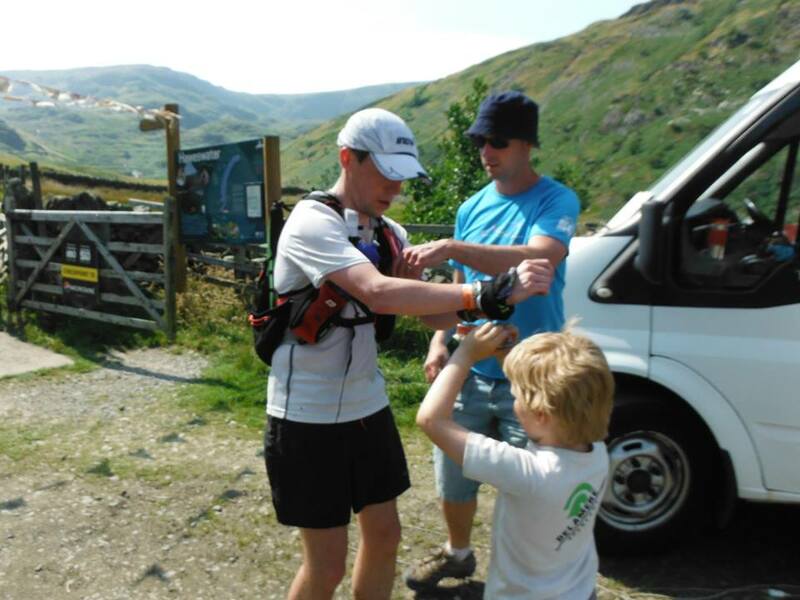 Nick has amazing powers of recovery; he looked awful when he got to Mardale last year as well, but after a bit of a rest, he managed to make up for lost time and caught Andy at the finish line. Ged and Jason seemed to stroll in, looking in fine form, and when Hackos arrived a bit later, he was all smiles, having found a couple of friends on the 100. John's blog seemed to show that he was struggling when he got to Mardale; he didn't look it at all. Not there for long, he too fuelled up, was spoken to by all the Spartans and headed off into the evening. The final Spartans to arrive were Jon and Hannah Moorhouse. Jon was running the 100, and had managed to find his wife Hannah, and they seemed to be having a blast, possibly winning the 'Most Cheerful Runners' award for the day, especially after a bit of a dance! Not everyone was smiling. We'd heard tales of Andy and Dave pulling out, and Steve went out to meet Paul, who retired at Mardale. He'd covered 75 miles in blistering conditions, and was still in good spirits, despite the DNF. It takes a lot to recognise that even if you don't finish a race, you've still made a monumental achievement, and I think Paul could see that, despite his disappointment. This really was why were here. To see the smiles on our mates' faces as they turned the corner towards the checkpoint, to tell them to finish the race, to help them off with their socks to inspect the damage to their feet. (I used a lot of antibacterial hand gel after doing that for Paul!) That's why we'll be there again next year. Lesson 9: Medical support is wonderful! Each year there are a lot of people unwell, struggling and in need of attention. For the first year, we had a medic onsite, who, whilst not very busy for the entire day, was able to make better decisions than we could, and also who was able to devote his whole time to looking after people. 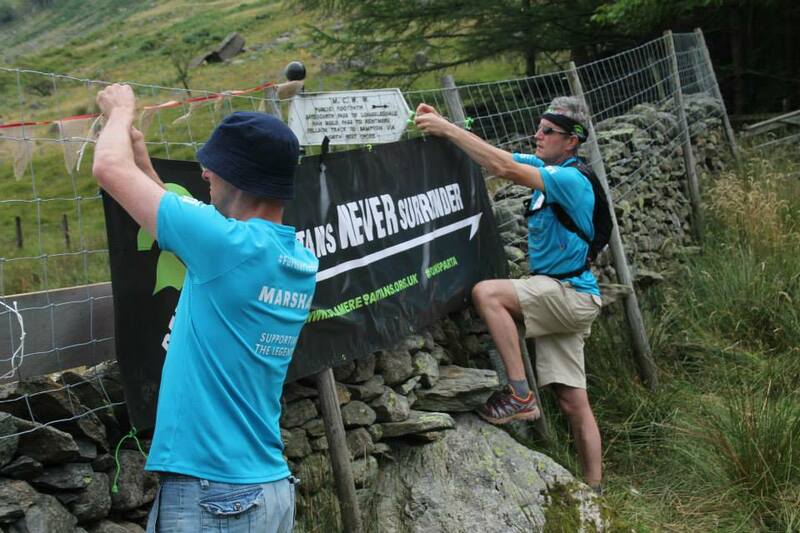 Had we had to do this ourselves, it would have detracted from our ability to look after the rest of the runners. Lesson 10: If we don't lose a runner, something's gone wrong! Over a hundred miles, you're bound to get lost. 3 runners had left Howtown and not checked in with us. One of them, Eduardo, had a disagreement with another runner about which way to go. Eduardo had a map, the other guy had a gps. Surely you follow the gps? Apparently not... It was 10.30pm, and we'd had very clear instructions from HQ: don't let the bus for the retirees leave without the 3 missing runners, and don't let them carry on past the cut off point of 10.45pm. 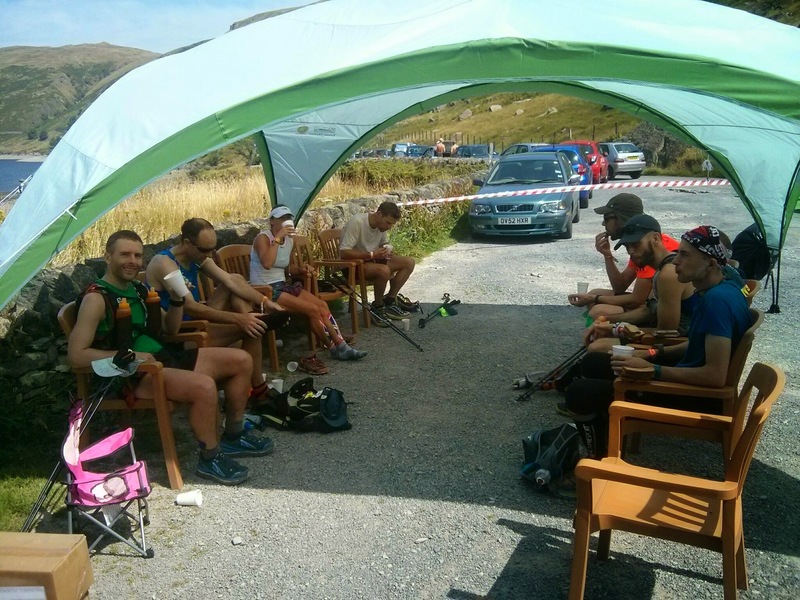 The penultimate runners arrived after the cut off, and were retired from the race, fed, and loaded onto the bus. And so we waited. And waited. At midnight, we were asked if a couple of people could go and look for Eduardo. The last thing that HQ had heard from him was he was mentally sound (not everyone was) and he was heading south, with the lake on his left. Tim and Alan went out for an hour, but came back alone. The bus driver had to go, and so at 2.30am, we set as many lights as we could flashing across the lake, left a sign saying that if Eduardo should arrive in the night, he could let himself into the van and sleep in there. We woke at about 7am, and there was still no sign of him. He'd been told to get into his bivvy bag and hunker down for the night. We had a slow start, with more sausage sandwiches for breakfast, when a walker came into the checkpoint, just as we were talking about what to do. Paige pointed out what a coincidence it would be if this was him, and lo and behold... Poor Eduardo came down from Fusedale the wrong way, and ended up too far north, but still on Haweswater. He had sheltered under a bush for the night, and then come on to find us when it got light, testimony to the fact that you really need the right kit to do a race like this one. After that, it was a case of packing up, tidying up and heading home for a kip. Will we be back? Yes, with some of the same faces, and we already have some new volunteers. 5 of the marshals from this year will go on to enter the race next year. The rest of us are a bit more sensible. Have we learned anything that helps in our lives away from an ultra marathon checkpoint? Yes, I think so. We've seen people at their very best, going through hell and determined to carry on. It's been an inspiration again, not necessarily to run an ultra marathon, but to be a little bit better than we were at something, each day. We've had the privilege of seeing people achieve something, helping them to achieve something that they've been working for for a very long time, in some cases to realise a dream. 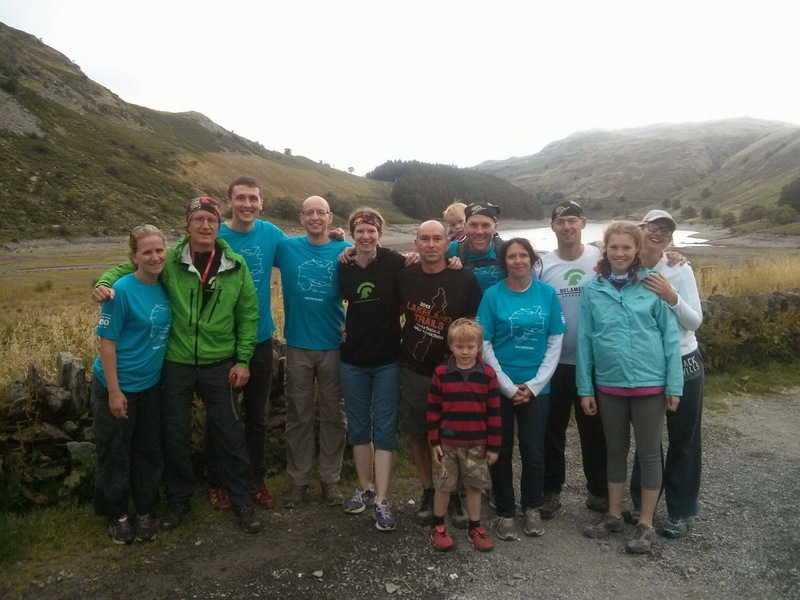 And we've given something back to the running community, we've been part of something massive. Which is what it's all about.